Posted on May 26, 2010	by Michael Gorton, Jr. This is the sixth edition of Roanoke Vineyards De Rosa Rosé. And according the vineyard, this is the best to date. While I did find this more enjoyable than the 2008, I honestly can’t say if that statement is true. I have only be visiting Roanoke Vineyards for the better part of a year. But this is one of my favorite rosé’s of the year. 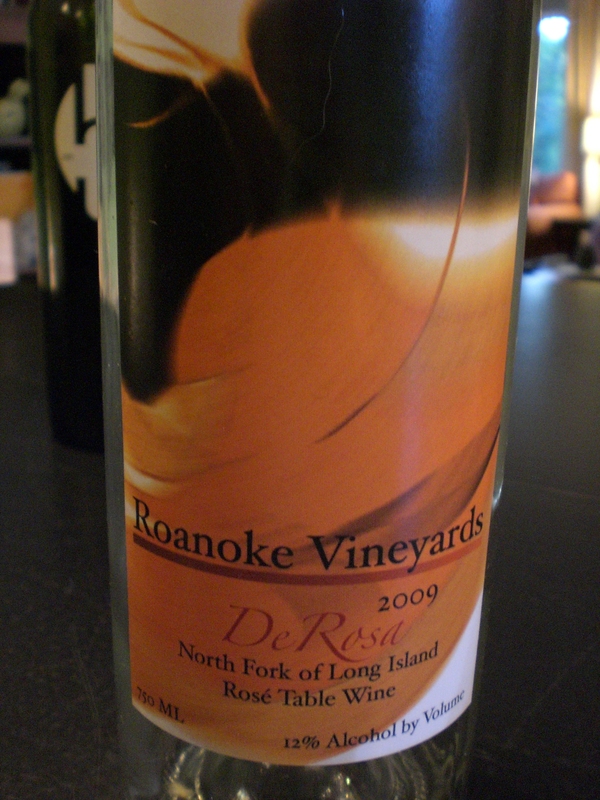 Roanoke Vineyards 2009 DeRosa Rosé ($16) is a blend of 51% Merlot, 10% Cabernet Franc, 17% Cabernet Sauvignon, 22% Chardonnay. It is stainless steel fermented and it did not go through no malolactic fermentation. There is a little of Gabby’s Cabernet Franc in there. There was great acidity and it had a dry finish. The mouth feel was a medium body. And I was getting a little bit of a fizzyness on the palate, it could be because it was just recently bottled. There was a nice strawberry and mineral finish. I really liked this wine. I had this at the end of a day of tasting and farm stand shopping on the east end. I stopped in to say hello to Adam and for a glass of rosé before I went home. While at the tasting room, I chatted with some ladies from Connecticut. We talked about baseball and the Long Island growing season. We talked about how Long Island is the best place for grapes and how vineyards make some excellent wines. Each of them wound up having a second tasting and going home with some Pearle Chardonnay and Roanoke Cabernet Franc among other wines. I think it was Adam’s deft ability to handle the tasting room as opposed to my talking baseball. This entry was posted in 2009, Roanoke Vineyards, Rose. Bookmark the permalink.